The nearest town to this beach is Newport, Rhode Island (see comments for question about the name and location of this beach). I found lots of blues, reds and purple colors, lots of marbles and coke bottles pieces. the first hour I found about 20 jewelery quality pieces, I threw back hundreds to age/wash longer. Beach is best after a storm. Watch out for very slippery rocks you climb over. Monihans is most certainly a treasure trove of it unlimited amounts of beautiful pieces. I personally search all different ways sometimes I scan the ocean front at low tide and other times I will lift rocks dig in areas do little small excavations of of different spots all along this rocky shore line and I will never leave without a number of colors sizes and shapes. I have found some rare treats there as far as one of a kind of pieces I have found five so far but that is only two summers' worth. There is not a ton of finished cobalt blue there but the aquas the light blues and whites greens browns of all tones are endless the bigger pieces tend to be higher up and under rocks the itty bittys are endless there and pottery is also a huge score with all kinds of cool prints. 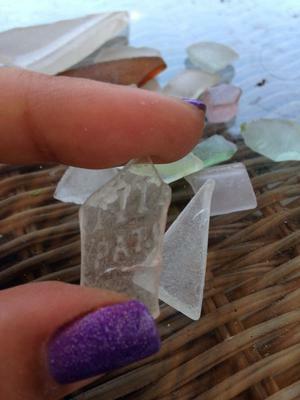 I hate even sharing all this as it is my treasure trove but I can't keep it all to myself knowing that so many others love sea glass just as much as I do so get on over to Monihans dock at the end of Narragansett Pier and you will find its a little place of heaven on earth. Pieces are usually pretty small, but is not rare. I found quite a few pieces in a very short period of time, but only a few are jewelry grade. I just want to say, seeing that I am an avid sea glass searcher and beach goer,that the beach pictured & called Summer's Beach is not remotely Newport, R.I.
İndeed it is NEAR the absolute best sea glass spot I've ever experienced, and that is in Naragansett R.I. I saw a few remarks about Scarborough Beach and that is further south. The beach pictured is just called Naragansett Beach which is located a short walk from "the pier". If you were to turn around, with the arches behind you, and walk along the beach wall you will come to a place called Monihans Clam Shack.. (on your left).. immediately after there is a boat launch and parking. Off to the right is a treasure trove..
All along that coast line is amazing (so much so I almost didn't give specific details. .lol)... I will soon submit pictures of my findings.. Am going 2morro and will show what I find in a couple hours of time..
We arrived today at Newport RI with plans to visit Summers Beach based on the sea glass report. Unfortunately, no one here has ever heard of Summer's Beach. Did it perhaps go by another name? One of the locals who has lived here 26 years said that he never heard of a beach named Summer's and suggested we explore Gooseberry Beach. We will head there tomorrow morning. Regardless, Newport is a wonderful town not to be missed! Try Island Park Beach near Portsmouth, Rhode Island - every grade and color, usually on an everyday basis. This is a small neighborhood beach that has a southern wind sometimes quite strong. I have an amazing collection from this little beach. I lived across the street for ten years. I would say luck of the draw, after a storm is best, I will give it a good rating. It can be too crowed in the summer. It is a very small beach but I never left disappointed.